2017.11.10 FOS, All Living Fear, The Ghost Of Lemora triple headliner! 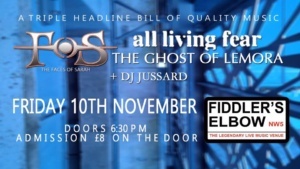 More good news ... we're playing with The Faces of Sarah and All Living Fear at the Fiddler's Elbow, Camden, on Friday 10th November! A great live venue, and "a triple headline bill of quality music".